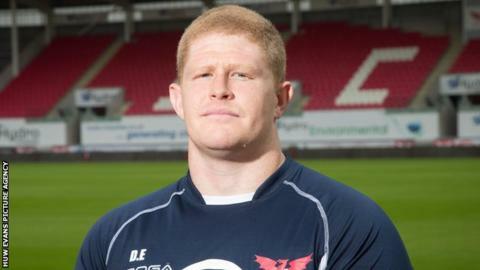 Prop Dylan Evans says it would be a "dream" to play for Wales after completing his permanent move to Scarlets. The 26-year-old loose-head was born and raised in Australia, but qualifies for Wales through his father. Evans hopes to follow in the footsteps of Jake Ball and Gareth Anscombe by earning a call up to Warren Gatland's squad despite being born outside Wales. "If I could play for Wales that would be unbelievable," he said. "I've always lived in Australia and supported Wales so I've taken a fair bit of stick from my friends back there. "But I've got to concentrate on getting into the 15 for the Scarlets first, have a big pre-season and hopefully a good season. "It would be everyone in the family's dream I think but I've got a fair way to go first." Evans previously played for Newcastle and NSW Country and spent a summer with Melbourne Rebels. His grandfather Randall represented Wales youth in the 1960's and also played for Llanelli RFC. It was during a visit to see him in February that Evans impressed on a trial to earn a one-year deal with Wayne Pivac's side. "My grandparents have been telling me that they've had me in Scarlets jerseys since I was about three-years-old," Evans added. "My mother wanted me to clean out my closet before I came to get rid of some old stuff and I found probably three or four Scarlets jerseys from ages ago. "Coming here has definitely been something I've wanted to do my entire life pretty much."